A playwright, much enamoured with tragedies based on true stories, once tried to write a melancholy play about the Cellingo. He worked on it for years, travelling around the world to interview people who had heard the Cellingo play, spending nights furiously scribbling down potential lines and characters. He went everywhere to collect his facts, from the Mountains of Oddness to the Splendid Sea, from the little towns of Arizim to endless Oneiropolis itself; he spared no expense in his pursuit of the true tragedy of the Cellingo. But again and again he failed to find something useful; again and again he threw out his notes. 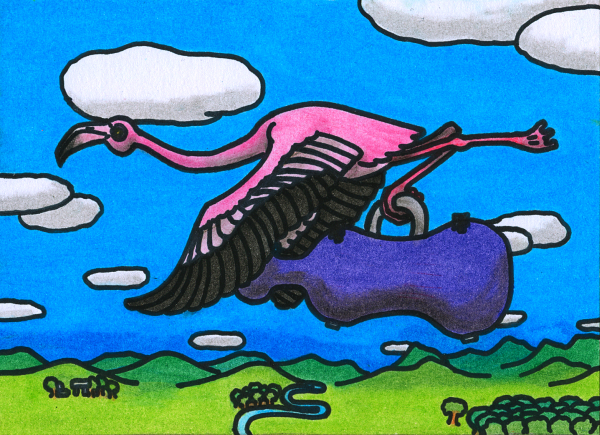 Sometimes he thought there was simply nothing tragic about a flamingo that travels the world playing the cello. But that can’t be, he told himself. The essential ennui of existence is well-established. Everything is flawed and ultimately pointless, and anyone who does not see the tragedy inherent in the world, the inevitable triumph of the darkness of human nature, is a fool. Not that the Cellingo was human, of course, but that didn’t enter into it. There must be some angle, some way of looking at this, some way of deconstructing this creature’s narrative that would show that it was all just tragic self-delusion. Unfortunately, the facts didn’t agree with his intentions. Everyone who had heard the Cellingo play was ecstatic about it – “you’ve never heard a cello played until you’ve heard it played by a flamingo!” An alarming number of people claimed to have been visited by the Cellingo when they were deeply depressed, even suicidal, and its beautiful music had given them hope and strength. The first time he heard that story he thought he’d finally found the right approach: something about the bittersweet illusions we must embrace to keep from going mad, even though in the end our happiness is not real. Or something like that. But then it turned out that the person he was talking to really was happy, and that the strength and hope they had derived from the Cellingo’s music was quite real. Further interviews confirmed this. He was devastated. After that disappointment he tried to focus on the Cellingo itself. Surely there was something terrible in its past to make it do this, to make it travel around the world like that. Maybe it had been abused, or grown up an orphan, or witnessed some horrific event? But no. Nothing out of the ordinary at all. Just a regular flamingo with a love for cello music. Not even a hint of something awful. It was infuriating. He assembled thousands of pages of notes. Descriptions of sightings, of concerts, interviews, sketches. There must be some way of turning this into a good play – a play that would leave audiences confused, puzzled, and vaguely unhappy. He could do it, he knew he could. He rented a small cabin near the Forest of Eyeballs and got to work. He threw out enough ideas for ten plays. He wrote lines, crossed them out, screamed. There was no way of making this work. Even when he filled it up with self-referential passages it still felt genuine. As he became more obsessed, he stopped paying attention to himself. There was nothing in the world except this play, this awful play that he couldn’t write. He started to deteriorate, mumbling to himself as he slouched around the cabin. Sometimes he cried in his sleep. One misty morning in the spring, he decided he’d had enough, and he was finally going to kill himself. He’d do it in some odd way, leave behind an incomprehensible poem, and maybe that would be enough to uphold his reputation as a true artist. Some part of him didn’t want to do this, didn’t want to die, but that was just silly. Life was inherently depressing, anyway. Just as he was about to kill himself, he heard the beating of wings outside, and the sound of something large being set down. He was filled with horror. No, this was too maudlin, too trite! But there it was, on his doorstep: the Cellingo. It began to play, and the music was beautiful; it was so beautiful and it made him so happy that he started to cry. He cried like a baby for what seemed like hours. When he recovered the Cellingo had left, but he wasn’t sad about that. He burned his notes and went for a walk in the forest. There a witch named Baba Yaga turned him into a newt, and he spent eleven years living in a creek. He wasn’t sad about that, either. Being a newt was fun. When the spell wore off, he went back home. He tried to write a couple of pessimistic stories, but he just didn’t have it in him anymore. Instead he wrote some very silly limericks, which none of his colleagues liked; nowadays they’re considered classics. One of them is about a flamingo. This entry in the Oneiropolis Compendium was made possible by Ryan.